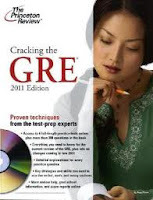 Cracking the GRE by The Princeton Review is an amazing resource. I took the 2010 edition out of my local library about eight months ago as I was preparing for the graduate record exam. This is one book I was glad I had during that stressful time. • Online, interactive tutorial lessons with extra practice problems"
What Do I think About Cracking the GRE? This an amazing book which helped me a great deal. I think what surprised me the most was that I didn't feel like I was reading a textbook and I wasn't getting bored; I was truly engaged. Of course I had to take breaks often in between readings and practice quizzes, but that's the only way to really grasp everything. I learned so many things that I will implement beyond the GRE, such as how to really take a multiple choice test. I had it all wrong! No wonder I hate exams, especially multiple choice. However, Cracking The GRE really helped me understand the best way to tackle multiple choice questions. It also had so many other strategies on tackling almost any type of test. The math part was also astounding! Cracking The GRE gradually took me from the easy math problems, to the medium and then to the more advanced. Between each section I was able to quiz myself and refer back or re-read whatever I wasn't confident with. The vocabulary part was absolutely fantastic. I had this huge list of words and the definitions to study. Since vocabulary isn't my strongest point I was at first intimidated by this section. Then when I set a schedule for myself on how many words I'll tackle a day, when to review, and when to quiz myself I felt a lot more confident. The quizzes in the end of each vocabulary section were really interesting; actually, they were quite addictive. I found myself studying more and more vocabulary words just so I can take the quizzes and see how many words I can remember. The analytic section was great as it had a lot of essay questions to practice from. When you do the practice essay questions you are to time yourself so that you don't exceed the time allowed on the real GRE. What I really liked about this part is that you are giving a breakdown of how to start the essay. I actually memorized the outline/template provided and applied it on the real exam. All in all Cracking The GRE is an amazing resource and I would recommend it to everyone who is thinking about taking the GRE, as well as to anyone who wants to just brush up on their skills. Go to your local library and see if you can borrow it from there for free or go ahead and buy it; it's really worth it (It's about $14 on Amazon.com). <---If you would like, you can get the edition with the DVD ; I haven't used the DVD before so I don't really know what's in it.